He smiled too much. He didn’t run enough. He played the air guitar. He threw up at the Super Bowl. He was passive aggressive. He didn’t lead enough 4th quarter comebacks. He told your boss not to give you that promotion. He convinced Napoleon to attack Russia in the winter. If you ever needed anyone to blame for anything for 11 years, McNabb was a handy target. Part of that had to do with how tough it is to be QB in Philly, part of it has to do with a pricklish personality that never allowed him to “get” Philadelphia, and part of it (“he smiles too much”) was sheer nonsense. But even if I concede everything that drives people crazy about McNabb, there is still simply no debate that “Five” is the greatest QB in Philadelphia Eagles history. And it’s not close. He has the record for Most completions, most yards, and most TDs. He played in 6 more games than the beloved Ron Jaworski and threw 41 more TDs and 51 less INTs. He had a winning percentage of 65.2%, while Jaws was just over 50%. He threw 66 more TDs and 5 less INTs than Randall, whose winning % was around 59%. What makes these numbers even more impressive is the fact that, with one single notable exception, McNabb was playing with receivers who never approached the level of skill of Mike Quick, Harold Carmichael, or even Keith Jackson. Due to the Eagles insistence that “the system” was more important than anything else, McNabb spent season after season passing to James Thrash and Todd Pinkston. Just how good was McNabb? The mindblowingly bad Thrash played with the Redskins for nine seasons and caught for 1620 yards. In just three years with McNabb, he caught for 2026 yards. Coincidence, or an example of a great quarterback making a terrible player better? (As for Pinkston, once the Eagles let him go, not a single team showed interest.) In the one single season during his prime that McNabb had an unequivocally great wide receiver, he had the greatest season any QB in Philly has ever had, throwing for 3,875 yards, 31 TDs and a mere 8 INTs, while leading the Eagles to a 13-2 record in games he started, best in team history. McNabb then threw for 357 yards in the Super Bowl (the most anyone not named Kurt Warner has ever thrown in a Super Bowl) against a Patriots team that was cheating so hard they made the Black Sox look like choir boys,but it was allegations of McNabb (maybe?) throwing up in the end that became the story of the 2004 season. Despite all the yards, and despite the fact that he shredded a Pats defense had completely shut down Ben Roethlisberger and Peyton Manning in the two games previous, McNabb’s Super Bowl, and season, were seen as a failure. In addition to his questionable attitude, the other thing working against McNabb was the fact that he came along at roughly the same time as Brady and Manning. McNabb was not as good as the other two QBs that came along at the same time, and so, by some sort of twisted logic, he sucked. It was absurd and irrational, but Eagles’ fans pride themselves on their passion, not their rationality. 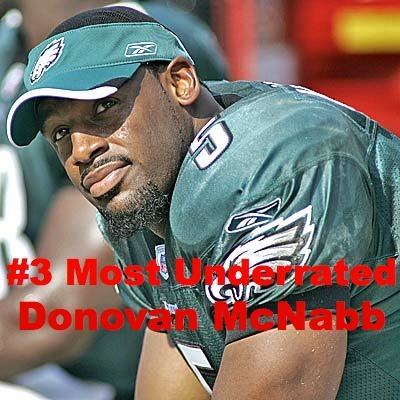 McNabb never understood that (as opposed to local icon Brian Dawkins, who understood it implicitly), and his lack of understanding of their rather diminished his accomplishments in the eyes of many Eagles fans. Now that time has passed, it is time to re-evaluate McNabb’s value as an Eagle. His stats (and his close-but-no-cigar career) compare favorably with the undeniably great Jim Kelly. Kelly played 11 seasons with the Bills, McNabb played 11 for the Eagles. Kelly played in 160 games, McNabb in 148. McNabb passed for 2 more yards per game, Kelly threw slightly more TDs per game (1.48 to 1.46), and McNabb threw 75 less interceptions than Kelly despite playing in 12 fewer games. (And don’t forget that Kelly was throwing to Andre Reed and James Lofton, not Pinkston and Thrash.) McNabb also ran for 3249 yards for the Birds, while Kelly ran for 1,049 for the Bills. Kelly went 9-8 in the playoffs. McNabb went 9-7. Jim Kelly is a God in Buffalo. And yet, here in Philly…Until more people in Philadelphia can separate McNabb’s incredible career from their own personal feelings for him, he will remain one of the most underrated athletes in Philadelphia history.